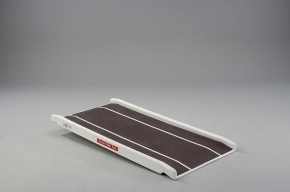 It's manufactured by Jet Marine and available in several different sizes, and with this ramp being made from fibreglass, is relatively lightweight compared to most metal options. I ordered this so my Mum can get her scooter out of the front door, Its very light and portable and has a good non-slip coating on it . Fast delivery .